It’s hard to believe there was ever a time when I thought squirrels were cute. Frolicking in the treetops or striking an adorable pose on a fencepost, squirrels used to make me smile. I was charmed by their bright little eyes and adorable chatter. I was fascinated by the way they twitched their fluffy tails while turning a hickory nut over and over in their human-like hands. How could anyone dislike a squirrel? Then I became a homeowner and quickly discovered that squirrels like to nest in attics and raise their babies there. They enjoy tearing out insulation and nibbling on electrical wires. They excrete wherever they please. They’re fond of garages, too, where they sometimes take up residence under the hood of a car. But none of those things were what turned me against squirrels. I crossed over into the haters-camp not long after I put up my first bird feeder. I couldn’t wait to plop down at my kitchen table with a steaming mug of coffee and watch my feathered friends enjoy the seed I’d carefully funneled into the feeder. But no. Before the first bird took its first bite, the squirrels arrived en masse. Within minutes, every last bit of birdseed was gone. It was then that I declared war. I banged on the window and hollered every time a squirrel came near the feeder. I coated the feeder pole with Crisco. I even went so far as to threaten the squirrels with a BB gun. All to no avail. Finally, just as I was about to give up and take the feeder down, the solution wandered into my yard. A stray cat. And as luck would have it, she was pregnant. From that day on, a large and ever-changing herd of farm cats kept the squirrels at bay. But a few months ago, for the first time in 30-something years, I found myself feline-free. Within hours, the squirrels knew it. They taunted me from my suet feeder. They sunbathed on the railing of my deck. They left acorn caps on my front porch. They partied in the eaves of my garage. The afternoon I found an expensive birdfeeder empty and smashed on the ground, my blood began to boil. This was a battle I had no intention of losing. I bought a baffle to put on the shepherd’s crook that held the feeder, but soon discovered the pole was too slender to support the bracket that kept the baffle from sliding down. So I wound electrical tape around the pole to hold the bracket up, which worked only until the glue on the tape melted. Finally, I bought a strong clamp to hold up the bracket that held up the baffle and—voila—it worked. 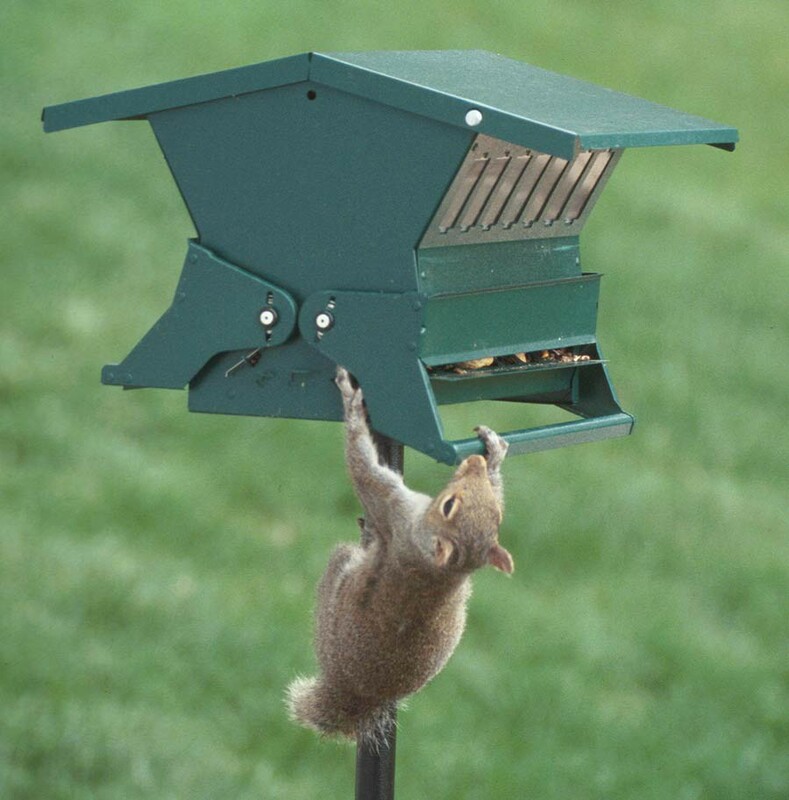 No more squirrels on the bird feeder. But how to keep them off the porches and out of the garage? The answer was staring at me from behind the chain-link fence in my backyard. Sophie and Iniesta—the dogs who, over the course of the past five years, have dispatched countless moles, voles, possums, skunks and groundhogs—were surely wily enough to defeat squirrels. Weren’t they? There was only one way to find out. I moved the doghouse and food bowls from their pen to the porch nearest my main bird feeder. I opened the door that connected the porch with the garage. Then I let the dogs out. I’ll spare you the gory details. Suffice it to say that I no longer have a squirrel problem. But there’s another pest still at my bird feeder. Which just might be the subject of my next column.